Brief description: After a very short introduction to CERN, the LHC machine and the four LHC detectors, the computing challenges are described in terms of nature and scale, leading to the Worldwide LHC Computing Grid collaboration. The CERN Tier-0 is an important part of WLCG; in order to support its remote extension in Hungary, a number of transformations were required. The talk then describes the steep rise of the future LHC computing requirements and the options currently investigated to address them. Commercial clouds are potentially part of the solution; CERN is leading a consortium of ten research organisations driving HNSciCloud, an EC-funded project to understand how to seamlessly integrate commercial cloud resources into the workflow of the on-premise data centres. Dirk Duellmann leads the Analytics and Development section of CERN's Storage group. 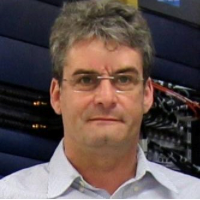 He is responsible for the design and evolution of CERN’s high performance disk pools for physics data analysis and he chairs the working group for Infrastructure Analytics of CERN's IT department. Previously he lead the Worldwide LHC Computing Grid (WLCG) projects for persistency framework development and for distributed database deployment. Dirk joined CERN in 1995 after receiving a PhD in High Energy Physics from the University of Hamburg. Before he worked in several software companies on the development of database management systems and applications.